What better way to officially start winter than by making a big pot of a hearty soup or stew? No one does it better than Bernard Clayton, Jr. I adore this man and his books, as you can read from some of my former blogs. Bernard and his award-winning books are highly respected and always very comprehensive. This cookbook covers a wide range of soups from crab to peach, and includes many classics such as New England Clam Chowder and U.S. Senate Bean Soup. You will find international soups from Japanese Shabu-Shabu to Nigerian Peanut Soup. 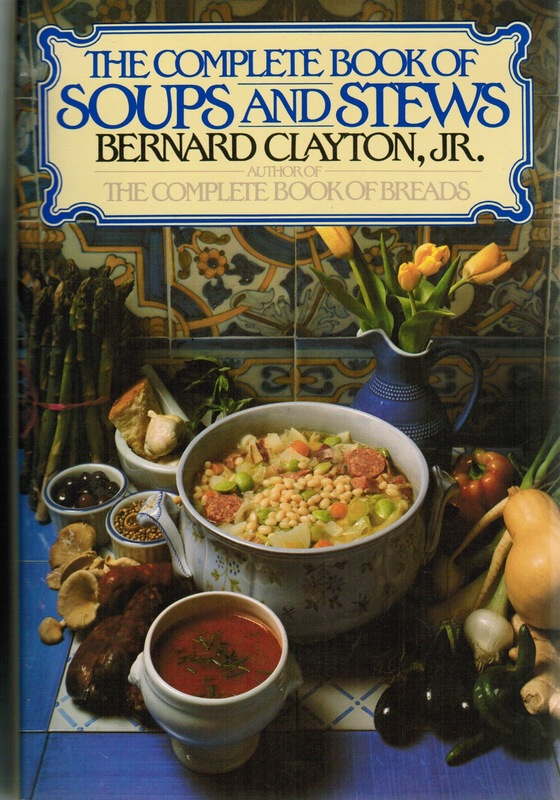 All together there is an eclectic collection of 250 recipes for soups, and 50 for stews, along with explicitly clear instructions and Bernard’s always informative personal anecdotes and historical backgrounds. When Bernard was researching recipes for this book, the first stop was New York City to have dinner with Craig Claiborne at a Chinese restaurant, followed by lunch in Boston with Julia Child and her husband, Paul. It was at the luncheon with Julia where Bernard found his first soup for the book – a “Harvest Cream of Onion.” How’s that for a one incredible weekend?! We should all be so lucky. I just happen to have two copies of this wonderful book! Now two winners can have this book to enjoy throughout the cold winter months. Just email me by midnight CST Friday, December 24th with your name and email address to culinarycellar@aol.com and I will email you if your name is picked from the random drawings. Good luck!! I am in! love love love soups! !